In a very short time Scott X. Nady, widely known to many as Coach Nady, has created quite a buzz on the motivational speaking circuit both nationally and internationally. Coach Nady's clients have used the terms transformational, life changing and deeply moving to describe his speeches. 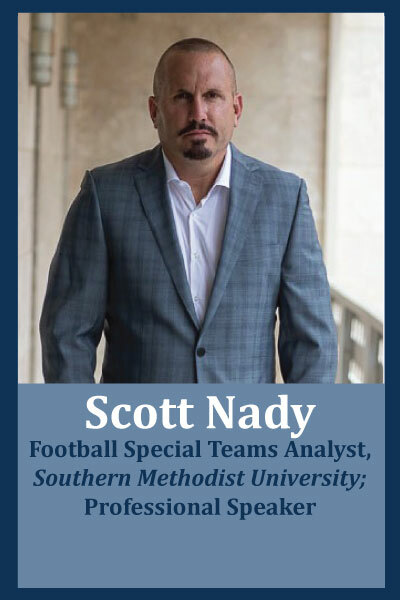 Before deciding to become a full-time motivational speaker, Coach Nady built the accomplished football program at Parish Episcopal in Dallas, Texas from scratch as the Head Coach for 13 years. After revamping the program, he served as the architect of Parish's two state championships—in 2010 and 2014.